ALON (Aluminum Oxynitride) is a synthetic ceramic with an excellent combination of mechanical, physical, electrical, chemical and optical properties. It is transparent from the ultra-violet (UV) --> Mid-Wave Infrared (MWIR). Because it is transparent in its polycrystalline form, it can be produced using conventional powder processing techniques in large sizes and complex geometries. Surmet is the only producer of ALON® Optical Ceramic, with a vertically integrated capability for its manufacture. This begins with the synthesis of ALON® powder, continues through the forming of green bodies, heat treatment of the green bodies into fully dense optical blanks and the subsequent fabrication of those blanks into optical components. Surmet has also provided ALON® blanks for optical fabrication by others, in special circumstances. 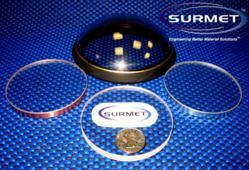 Surmet produces ALON ‘by the ton’, primarily for Transparent Armor and Precision Optical Applications. In collaboration with Thomas Jefferson National Laboratory in Newport , VA , ALON® Optical Ceramic will be evaluated as a High Power RF window material to replace the current ‘opaque’ alumina window. ALON’s properties such as thermal conductivity, thermal expansion coefficient and dielectric properties will be measured down to liquid helium temperatures. This will extend the current database for ALON® Optical Ceramic from -150C to temperatures as low as 2 degrees Kelvin. In addition to low loss tangent and high strength, ALON® Windows are also transparent allowing the inside of the superconducting cavities to be viewed during testing and operation. An important aspect of this project involves combining ALON® Windows with metallic ‘retaining’ structures, with hermetic seals which must operate down to cryogenic temperatures. This will require the development of new ‘brazing’ processes, since those used for conventional Oxide ceramics like alumina, are strictly not applicable to ALON. Surmet has an extensive background in the joining of dissimilar materials. In addition to innovative approaches to the metallization and subsequent brazing of ALON to metals such as Kovar, and Niobium, Surmet has also developed advanced processes to hermetically bond ALON to ALON while preserving its optical transparency and mechanical integrity. These new bonding technologies will enable ALON to be used in a wide variety of new applications, in many industries, including Oil and Gas drilling where high pressures, high temperatures and corrosive environments exist. Founded in 1982, Surmet Corporation is an Advanced Materials Technology Company, with a vertically integrated manufacturing capability. In addition to multiple facilities in Massachusetts , including its Headquarters, Surmet also has R&D and manufacturing facilities in Buffalo , NY and Murrieta , CA. We gratefully acknowledge the US DOD and DOE for their generous support. Consider using transparent ALON® Optical Ceramic in your next critical application. High performance ALON® Products are now available for your evaluation and use. To find out more, please go to our website http://www.surmet.com. What can Surmet and ALON do for you?